Dr. Damon Combs, a trained Podiatrist specializing on the foot and ankle, has been with South Hills Orthopaedic Surgery Associates since 2009. 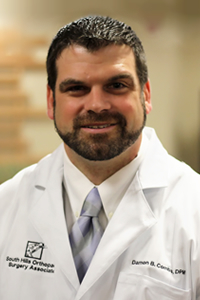 Looking for an opportunity to help others, Dr. Combs received his Bachelor’s Degree in Biology from Whittenberg University in Springfield, Ohio before attending The Ohio College of Podiatric Medicine. He completed his residency with the University of Pittsburgh Medical center, where he also completed his fellowship training in reconstruction and limb salvage of the lower extremities. “I love having the opportunity to improve the quality of life for patients and assisting in their ambulation ability, allowing them to walk easier,” said Combs. Dr. Combs is a member of the American College of Foot and Ankle Surgeons, American Podiatric Medical Association, American Podiatric Medical Student Association, and the Podiatric Association for Diabetes. He is associated with Sr. Clair Memorial Hospital of Pittsburgh, Radiance Surgery Center, and the UPMC South Surgery Center. Dr. Combs is married and has two children.